Easter won’t be Easter without Hot Cross Buns. This version has a combination of raisins and chocolate chips and less spiced than usual (by special request from my kids). These authentic flat “pocket” breads of the past, originally baked on hot stones have made a great comeback! The hollow or split pitas may enjoyed with any part of the meal or stuffed with hot or cold, savoury or sweet fillings. For best results, knead the dough very well and allow for a thorough first rising (until completely doubled) before shaping into flat breads and rising once more. Mix the yeast with the first measure of flour in a mixing bowl, the bowl of an electric mixer fitted with the dough hook or a food processor. Add all the remaining ingredients except the extra flour and mix well. Add just enough of the extra flour gradually to form a dough which can be handled comfortably. Take care not to make the dough to firm for it will be difficult to work with and the end results will be dry as well. Knead the dough by hand on a floured surface for about 5 minutes, in the mixer for 4 to 5 minutes or 2 to 3 minutes in the bowl of a food processor until smooth and elastic. Sprinkle lightly with flour and shape into a neat ball. Return the dough to the bowl used, cover and let rise until doubled, about 3 to 40 minutes – allow to rise very well and double completely for the best pitas. Knead down the dough and pinch off balls the size of a small apple for large pitas or the size of a large egg for smaller pitas. Sprinkle with flour, cover and allow to rise for 15 minutes. Roll out the balls on a well-floured surface into either round or oval-shaped pitas about 1 cm thick. Sprinkle with flour, cover with a cloth and rise 20 minutes. Place firm baking trays (not greased) which will not warp in the oven, into the oven and preheat the oven to 220ºC while flat breads are rising. 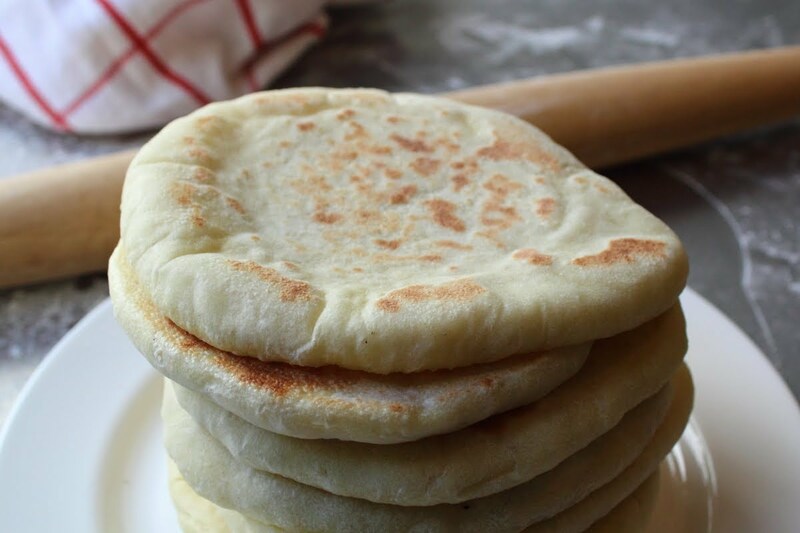 Turn over each flat bread when placing onto the hot trays so that the moist underneath side is on top and the pitas will puff up and become hollow during baking. Place the breads into the oven, reduce heat to 180ºC and bake for about 8 to 10 minutes or until puffed and lightly coloured but not browned. Cool on a wire rack. Recipe by Carolié de Koster from the Art of Cooking Recipe Book p. 832. Brush baked flatbreads with olive oil and sprinkle generously with the Za’atar Spice Mix. Serve with labneh (Greek yoghurt). A croissant is a buttery, flaky pastry named for its well-known crescent shape. 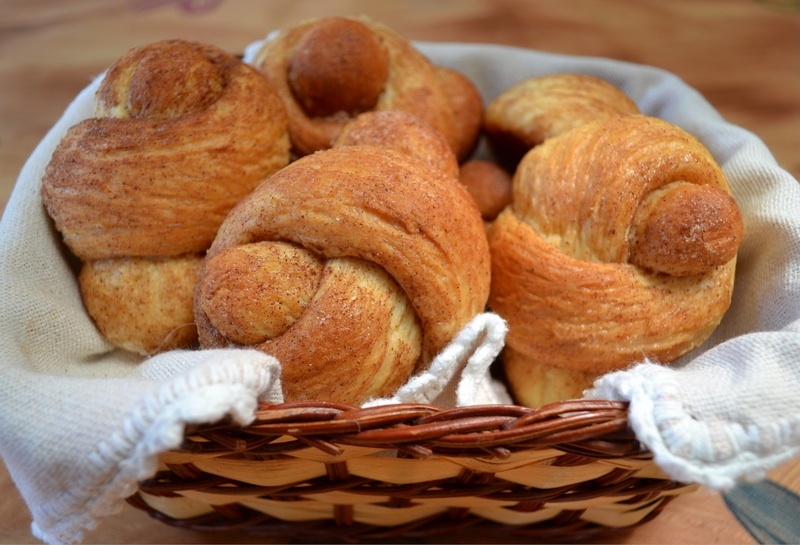 Croissants and made of a layered yeast-leavened dough. The dough is layered with butter, rolled and folded several times in succession, then rolled into a sheet, in a technique called laminating. The process results in a layered, flaky texture, similar to a puff pastry. After mastering the plain version, be sure to try the almond, cheese or pizza fillings below. Mix the yeast with the 750 ml cake flour in a mixing bowl. Add all the remaining ingredients except extra flour and butter/margarine and mix. Add sufficient extra flour gradually to form a soft dough and knead on a floured surface only until smooth. Cut the butter or margarine into six slices. Roll out the dough into a rectangular shape about 1,5 cm thick. Place three slices of the butter or margarine in the center of the dough and fold over the dough from the one side to cover. Place the remaining three slices on top and cover with the dough from the other side to seal in butter or margarine. Turn the dough 90° and roll again into a rectangular shape about 1,5 cm thick. Fold again into three layers and repeat until it has been rolled four times. Streaks of butter or margarine should still be visible in the dough to ensure flaky croissants. Cover the dough airtight and refrigerate at least 1 hour or up to 8 hours before shaping and baking. Divide the dough into two and roll out each portion on a floured surface into a circle about 25 cm in diameter and 1 cm thick. Cut each circle into 8 even-sized triangles by cutting into wedges as if cutting a round cake.Stretch the wide base of each triangle slightly and roll up the croissants loosely from the base to the tip. Make sure to end with the tips underneath to prevent them from curling up during baking. Twist each croissant forward into a crescent shape and place slightly apart onto un greased baking trays. Brush with glaze and allow to rise at room temperature for at least 30 minutes or until the croissants appear slightly puffy. Rising in a warm place will spoil the texture and the butter or margarine will leak out during baking. Bake at 180°C for about 20 minutes or until well-risen, firm and golden. Recipe by Carolié de Koster from the Art of Cooking Recipe book p. 846. Divide the dough into three and roll out three circles before cutting into triangles. Beat the butter, sugar and almond meal very well for 5 minutes – the mixture will be grainy crumbly. Add the egg and beat well for 3 minutes. 2. Add the flour and beat in until it is no longer visible and the mixture has become moderately firm. Refrigerate until ready to use but allow to soften a short while before using. Place teaspoons of the filling onto the croissants before rolling up – take care not to overfill. For one recipe croissant dough have ready about 150 g grated cheese such as a flavourful cheddar. Sprinkle the grated cheese over the rolled out circles and roll lightly into the dough with the rolling pin. Complete as explained above and sprinkle the glazed croissants with paprika or paprika mixed with a little cayenne pepper. Spread the croissants with a little of any suitable tomato topping for pizzas and sprinkle with herbs, grated cheese and any additional typical pizza ingredients. Roll up and sprinkle lightly with paprika or paprika mixed with a little cayenne pepper. Substitute 1½ cups (375 ml) of the extra cake flour with wholewheat flour for delicious brown croissants which may also be turned into cheese croissants as explained above. Sprinkle 1 – 2 cups (250 – 500 ml) grated Cheddar or Mozzarella cheese or crumbled Feta cheese and chopped fresh or dried herbs over the circles before cutting and rolling up. Sprinkle lightly with any preferred seasoining salt. Strips of ham and / or fried chopped onion or spring onion may be added with the cheese. Almost every European country has developed it’s own speciality yeast bakes based on a variation of sweet dough. 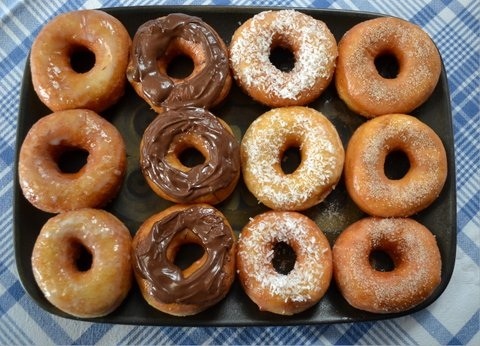 Be sure to have a look at the delicious variations made from the basic sweet dough here. Mix the yeast with the first measure of flour. Add all the remaining ingredients except the extra flour and mix well. Add sufficient of the remaining flour gradually to form a dough which is quite soft but no longer sticky and knead the dough 3 to 4 minutes in the bowl of an electric mixer with the dough hook or turn out onto a floured surface and knead 5 to 6 minutes with floured hands until smooth and elastic. Return the dough to a floured bowl, cover and allow to rise about an hour or until completely doubled. Knead down and continue as explained for the individual recipes. In most cases only ½ recipe of the dough is required for the speciality cakes made, leaving the other half for another product or a plain sweet loaf or buns as explained below. Divide the dough into gholf ball size portions and roll each portion into a rope about 10 cm in length. 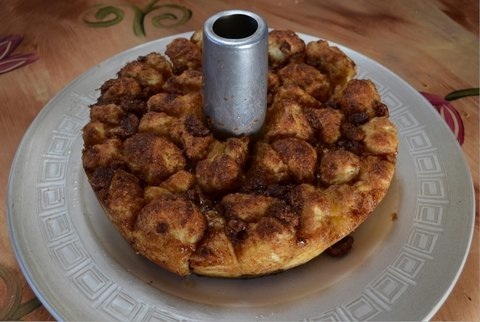 Place the meted butter and combined sugar and cinnamon onto two plates and roll each rope of dough in the butter and then into the cinnamon sugar. Tie into knots and place onto a baking tray. Allow to rise until almost doubled and bake at 180°C for about 18 to 20 minutes until firm and cooked through but not too dry. Allow to cool and serve as is or buttered if preferred. Recipe by Carolié de Koster from Art Of Cooking page 848. 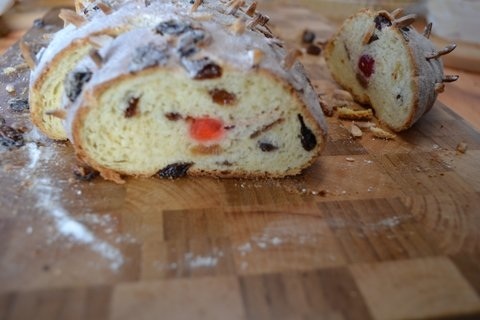 Stollen is a bread-like fruitcake and is traditionally served during the Festive period. While the dough is being prepared and left to rise, soak the fruit and nuts in the brandy and almond essence. Add the fruit to the risen dough and knead in until evenly distributed at the same time as kneading down the dough. Roll out the dough on a lightly floured surface into an oval shape about 2 cm thick or divide the dough into 2 portions to make 2 smaller loaves. Press the cherries into the dough and fold in half to create an omelette-shaped loaf/loaves. Grease a baking tray with butter or margarine and place the loaf or loaves onto the tray. Allow to rise in a mildly warm protected spot until doubled and bake at 170ºC for about 25 minutes until golden and thoroughly baked if tested with a cake tester. Remove from the oven and sprinkle with brandy. Brush with melted butter and dust generously with icing sugar. Allow to cool and serve sliced and buttered if preferred. Stollen is moist and tender if served fresh but may be kept several days before serving. If not intended for serving rather freeze. Recipe by Carolié de Koster from Art Of Cooking page 849. Irresistible bubbles of dough coated with butter, nuts, cinnamon and sugar. Knead down the risen dough and pinch off walnut sized balls. Grease an Angel cake tin or large loaf tin (30 x 12,5 x 10 cm) well with margarine. Combine the nuts, sugar and cinnamon in a bowl. Dip each ball of dough into the melted butter or margarine and roll into the nut mixture. Pack evenly and tightly together into the prepared tin, sprinkle any remaining nut mixture over the top and pour any remaining butter or margarine over as well. Allow to rise in a very mildly warm protected spot until doubled. Bake at 170°C for about 30 minutes or until well-risen and browned. Test for done-ness with a metal skewer and cool in the tin for 5 minutes. If the Angel cake tin is used, loosen the sides carefully and lift out the base of the Angel cake tin. Tie a length of string around the loaf to keep the balls together and turn out onto a cooling rack. Remove string and break apart. If the loaf tin is used, loosen the sides and bump the tin on a hard surface to release the loaf. Turn out, press the balls together if necessary and allow to cool. Break apart for serving. 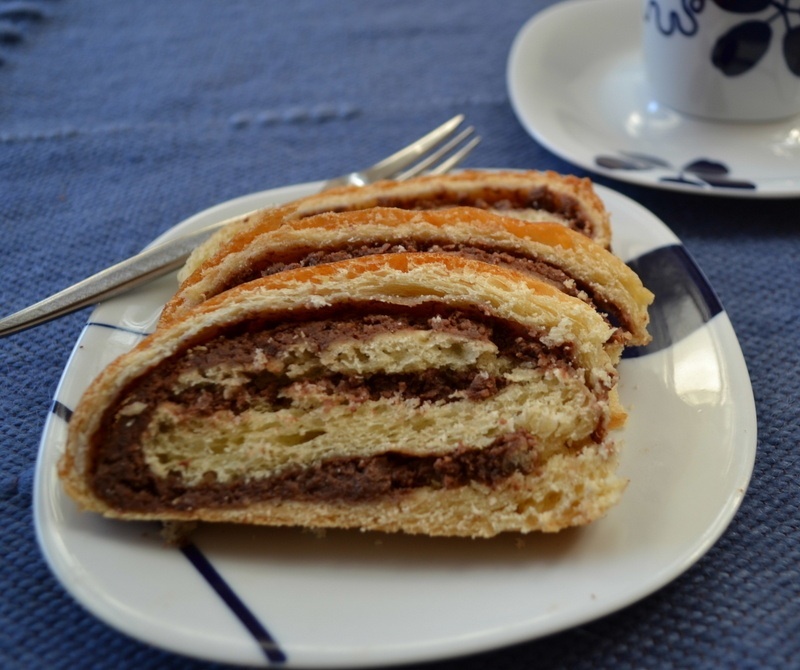 Soft sweet dough filled with the most flavourful nut filling imaginable! Make and cool the filling while the dough is rising. Place all the ingredients for the filling into a small saucepan and stir over moderate heat until the chocolate has melted. Continue stirring until the paste becomes smooth and thick. Cool to room temperature. Roll out the dough thinly on a floured surface to a rectangle of about 35 x 25 x 1 cm and spread evenly with filling, allowing about 2 cm at the edges uncovered. Roll up the dough from the longer side and tuck in the ends at the sides to seal in filling. Grease a baking tray with butter or margarine and place the roll onto the baking tray. Allow to rise in a slightly warm protected spot until doubled. Bake the roll unglazed at 160ºC for 20 minutes. Beat together the egg yolk and water for the glaze and brush generously over the partly baked roll. Bake 10 to 15 minutes more until golden and thoroughly baked if tested with a metal skewer. Allow to cool on a wire rack and wrap in aluminium foil until required. Serve thinly sliced as is or lightly buttered if preferred. Although the loaf may be eaten shortly after baking it improves in flavour if wrapped in foil and refrigerated for a day or two. Recipe by Carolié de Koster from Art Of Cooking page 850. 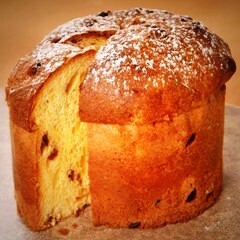 Traditional Panettone is flower-pot shaped and to achieve this effect it is baked in a deep high container with slanted sides. You can use a silicon mould, a 1 litre soufflé dish, a flower pot or just loaf tins – whatever you fancy! While the dough is being prepared and left to rise, soak the fruit in the brandy or rum. Add the fruit to the risen dough and knead until evenly distributed, while kneading down the dough at the same time. Shape into a neat round or cylindrical form and place into the prepared dish or tin to fill it no more than 2/3. Or, divide dough into 2 to make smaller Panettone. Allow to rise in a mildly warm spot until doubled and well rounded above the edge of the tin. Preheat the oven to 170 ºC while the dough is rising and bake about 25 minutes or until golden brown and thoroughly cooked if tested with a metal skewer. Cool in the tin or container used for 5 minutes, loosen the sides carefully and turn out onto a wire rack. Dust generously with icing sugar, cool and serve with butter. Recipe by Carolié de Koster from Art Of Cooking page 852. A super dough which lends itself to delightful variations in shape and size. Mix the yeast with the 3 cups (750 ml) flour in a mixing bowl, add all the remaining ingredients except the extra flour and mix well. Add sufficient extra flour to form a soft, slightly sticky but kneadable dough. Turn out onto a well-floured surface and knead 4 – 5 minutes or until smooth and no longer sticky. Flour the bowl, return the dough to the bowl, sprinkle with flour, cover and allow to rise in a mildly warm spot until doubled. Knead down the dough lightly with floured hands. To make french loaves, divide the dough into 3 to 4 portions, roll each portion into an elongated loaf according to the thickness and length desired and place onto rectangular baking trays greased with butter or margarine. Brush with salt water glaze if a crisp crust is desired or beat together the egg and water and brush with the egg glaze. Sprinkle with seeds if used and make a few deep diagonal slashes on top with a sharp knife or pair of scissors. Or make lengthwise slashes with a knife. Place the loaves in a mildly warm protected spot to rise until completely doubled. Preheat the oven to 200°C while the loaves are rising. Place the loaves into the oven and bake 5 minutes. Reduce the temperature to 170°C and continue baking for another 15 to 20 minutes or until crisp and golden. Recipe by Carolié de Koster from Art Of Cooking page 822. 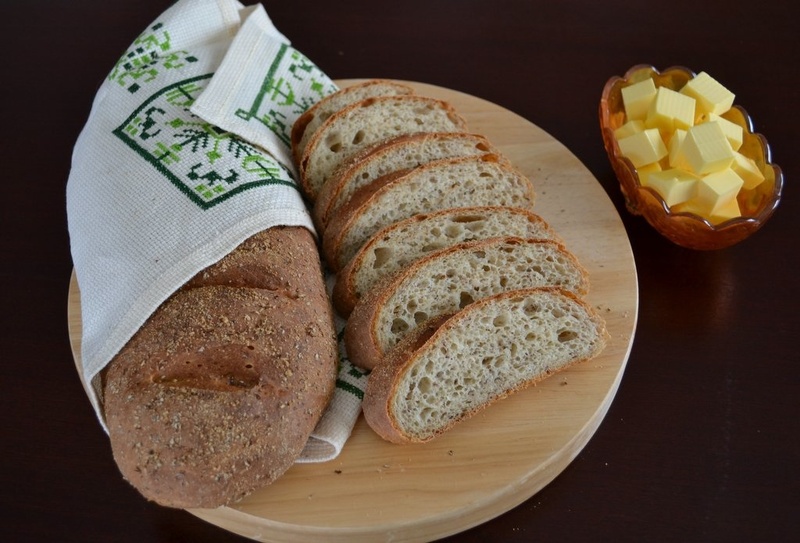 One of the best breads to serve with soup or as part of a cold buffet which includes salad, fish, cold meat and cheese. Combine the dry ingredients and add the butter, margarine or oil and honey, treacle or molasses and water and mix well. Add sufficient of the remaining flour to form a dough that is still slightly sticky and soft but just firm enough for kneading. To knead by hand, turn out the dough on a floured surface, knead for 5 minutes, adding extra flour as necessary and return to the bowl. Or, to knead in an electric mixer, knead 3 to 4 minutes with the dough hook or until no longer sticky, adding a little extra flour as necessary. Cover and allow to stand for 15 minutes. Knead down well, cover and allow to stand for another 15 minutes. Grease a baking tray with butter or margarine. Divide the dough into two portions and shape into oval-shaped loaves. Place the loaves onto the baking tray lined with a Wizbake baking sheet and brush with yoghurt or buttermilk and sprinkle with rye flour. 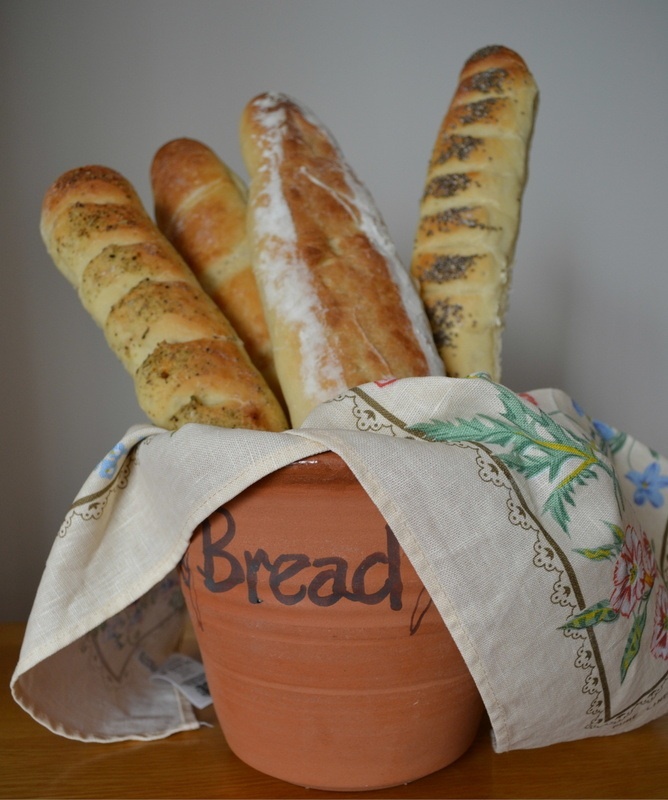 Slash the top of the loaves diagonally with a sharp knife or snip with a pair of scissors. Allow the loaves to rise until doubled and pre-heat the oven to 200°C while the loaves are rising. Place the well-risen loaves into the oven, lower the temperature to 190°C and bake for 20 minutes. Lower the temperature to 180°C and bake another 15 to 20 minutes or until the loaf is golden brown and sounds hollow when tapped on the top crust. Recipe by Carolié de Koster from her Art of Cooking Recipe Book page 813. If a bread with a dark colour is preferred use treacle or molasses. For a light bread use honey only or ½ honey and ½ molasses. Add 250 to 500 ml cranberry and nut mix or mixed cranberries and pecans or walnuts to the dough after the initial kneading. Mix until evenly combined and continue as explained above.